Acmadenia macropetala is an evergreen, small shrub, growing to a height of 500mm. It forms a single stem at the base that branches freely and loosely. The lower branches display leaf scars. The lax branches are glabrous (hairless), slender and smooth. The bark is brownish-grey with noticeable leaf scars. The branchlets are slender, covered with fine hairs and keep forking at the tip. The dark green leaves are tiny, 3-3.7mm long x 1.13-1.7mm broad. The leaves are lanceolate, fringed with very short fine hairs, opposite and dotted with glands. Hardly ever without a flower, the bushes are covered with deep pink flowers at the tips of the stems during autumn, winter and spring. Each of the flower's five petals has a noticeable dark pink nectar guide leading to the center of the flower. The petals 7mm long x 4.7mm broad, rounded, are dotted with glands and end in a short sharp point. Flowers are borne solitary or terminally between a pair of incipient branchlets. The fruit is a capsule with 5 chambers/carpels, 7mm long x 4.7 mm wide, covered with fine hairs between the carpels.. Each carpel contains one black shiny seed. The seed is 4mm long x 1.5mm wide. The seed ripens in November to December. Acmadenia macropetala is not protected by any South African legislation. Acmadenia macropetala grows in quartz outcrops on shale hills from Bredasdorp to Mosselbay, at an altitude of 200-500m. This species has been collected growing on a sandstone ridge on a north- facing slope. The genus name Acmadenia is derived from the Greek akme´, meaning highest point and aden, meaning glands on the anthers. This refers to the conical gland at the apex of the anther, found in some species in this genus. The genus consists of 33 species, which occur in the Western Cape and Eastern Cape. 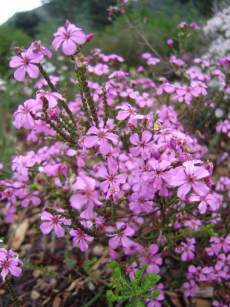 Other interesting species: Acmadenia obtusata forms an upright, rounded shrub with floriferous pink flowers in autumn. Best used as an accent plant in a fynbos garden or as a pot plant. Acmadenia heterophylla and Acmadenia mundiana are other cultivated species. The first species of Acmadenia to be described was described in 1781 as Diosma tetragona by Linnaeus' son. During the flower season bees, butterflies and other insects are attracted to the bush for its nectar and responsible for pollination. Buchu seed are produced in capsules from which they are expelled on ripening. This is known as ballistic dispersal. Ants collect the seed. The Rutaceae family is characterized by the presence of oil glands dotted on the leaves. When the leaves are crushed, a fragrant aroma is produced unique to each species. Acmadenia macropetala is an attractive small buchu with great horticultural potential and is not often used in gardens. 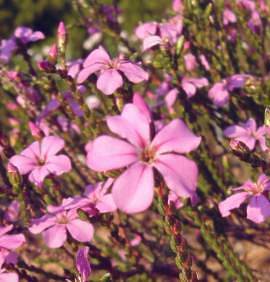 It is an ideal plant for the water-wise garden or fynbos garden. 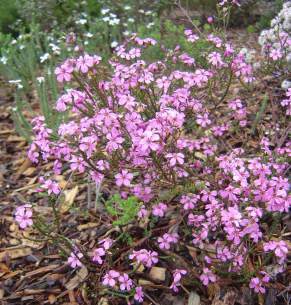 Acmadenia macropetala easily adapts to growing in the garden where it requires full sun and well-drained soil. It will benefit from well-prepared soil with compost and a thick layer of mulch. The plants also respond well to slow release fertilizer such as 3:1:5. Acamdenia macroptelala is a small shrub and best used in border planting or in the front display of any garden. Planted in a pot to decorate any stoep or patio. Buchu plants occur naturally in a mixture of fynbos plants and can be used in the same way. Planted with a combination of ericas, proteas, restios, felicias, phylicas, pelargoniums and other interesting companion plants. This species requires full sun and planted out in-groups of three or five with enough space to grow. Buchus respond to a fairly dense planting which helps to retain soil moisture. Planting is best done during autumn, winter and spring. To retain soil moisture and keep weeds to a minimum, add a layer of mulch . They require good watering in winter and moderate watering in summer. Do not allow plants to dry out, and once established, they will survive periods of drought. Acmadenia macropetala can be propagated by sowing seed and by taking cuttings. The seed capsules develop after flowering, seed are collected from the current year's capsules. Harvest the seed after the first capsules opened Place the capsules and seed in closed paper bag or closed container (not plastic). Store it in a warm and dry place. You can hear the seed expelled from the ripening capsule. The optimum time for sowing is during autumn. Clean seeds and sow on a prepared medium of sand and compost in equal parts in a seed tray. Cover seeds with a thin layer of bark and water. Place seed trays in a covered area with good light and ventilation. Keep seed trays damp and germination will take place within one to two months. Seedlings are pricked out when four true leaves have developed . Take care not to damage the fine roots. Seedlings are harden-off under shade structure for 3-4 weeks before placed in the sun. The growing tips of seedlings are pinched out to encourage bushy growth. Feed buchus regularly with a balanced nutrient. The yellowing of leaves can be treated with an application of iron chelate . After 8-9 months the plants can be planted out in the garden. Vegetative propagation (cuttings) is done from August to early October when suitable material is produced after flowering. Cuttings have the advantage of producing a larger flowering plant more rapidly than seedlings. Heel- and semi-hardwood cuttings, 50-70 mm, are taken from the current year's growth. Prepare cuttings by making a clean cut below the node and remove a third of the foliage . Dip the base of the cuttings in a rooting hormone. Firmly place the cuttings in a medium of 50 % bark and 50 % polystyrene. Ideally these cuttings should now be placed in an well-aerated propagation unit with a bottom heat of 24° C. Ideally, rooting occurs in 9-11 weeks. Carefully pot the rooted cuttings, using a well drained, humus-rich, fynbos potting medium (2 parts leaf mould, 1 part coarse sand). Plants are kept under shade for three weeks to harden off before being placed in the sun. Plants will be ready for planting in 7-8 months. Young buchu plants are pinched back to encourage bushy growth. Once established do not cultivate the soil around the root area. Feed regularly with a well-balanced nutrient. Phytophtera cinnamonnii, a soil and water-borne fungus, attacks the roots of most fynbos species. High soil temperatures promote the growth of this fungus, attacking the plant's root system. It prevents the uptake of water causing plants to die. Remove infected plants and use soil mulch to reduce the soil temperature. Disturb the soil as little as possible . Treat plants with a special fungicide prior to planting out. This is a precautionary measure to control the fungus and to protect adjacent plants. Brown, N, & Duncan, G. 2006. Grow Fynbos Plants.South African National Biodiversity Institute, Kirstenbosch. Gold, M. 1992. The Buchus Cultivation and Propagation. National Botanical Institute, Kirstenbosch. Goldblatt, P. & Mannning, J. 2000. Cape Plants, A conspectus of the Cape Flora of South Africa Strelitzia 9. National Botanical Institute, Pretoria & Missouri Botanical Garden, Missouri.